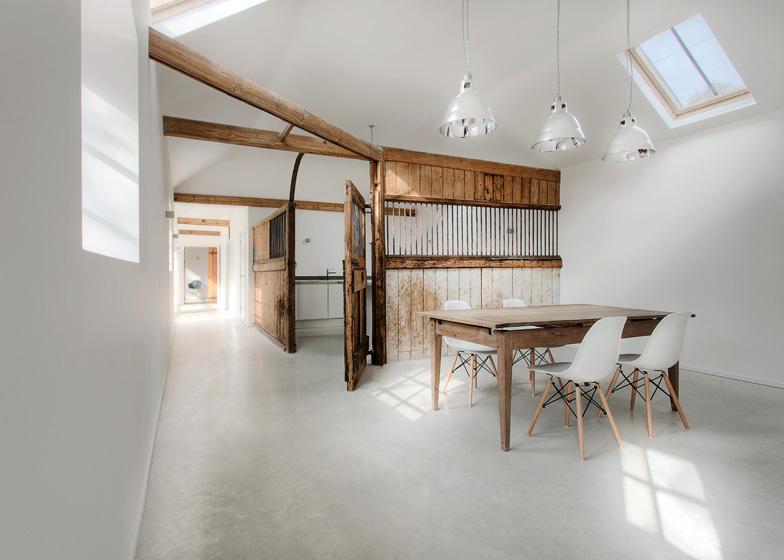 Architecture office AR Design Studio has converted an old stable block in Hampshire, England, into a three-bedroom family house (+ slideshow). The historic Manor House Stables, once home to a Grand National-winning horse, comprised a single-storey building with brick and stone walls and a gently sloping gabled roof. AR Design Studio was tasked with transforming the Grade II listed structure into a modern home without removing any of the period features. "The concept was to preserve the existing while making any new additions simple and pure in order to let the original character shine," explain the architects. 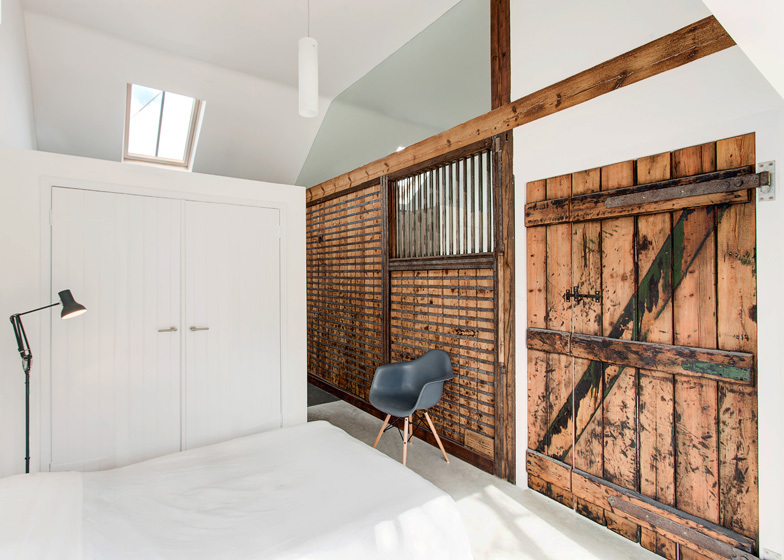 To retain the original timber partitions, the architects made few changes to the plan, creating rooms in the old stables and allowing a corridor to stretch out in front. The three bedrooms are pushed to the western end of the building, while a kitchen and dining room are located in the middle and a lounge opens out to a small terrace on the eastern side. Many of the original doors are restored inside the house, while the old timber-framed windows are replaced with modern glazing and powder-coated steel frames, and new skylights are installed to bring more light in through the roof. 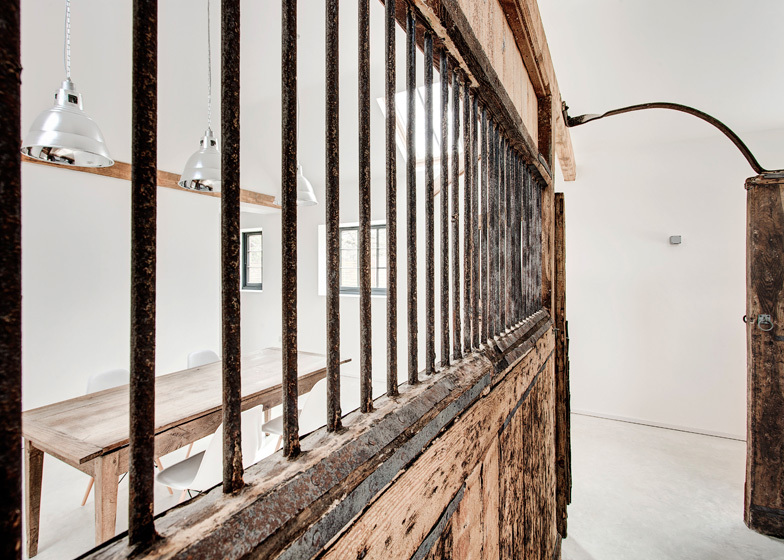 Redundant features of the stables are also reused in the design. 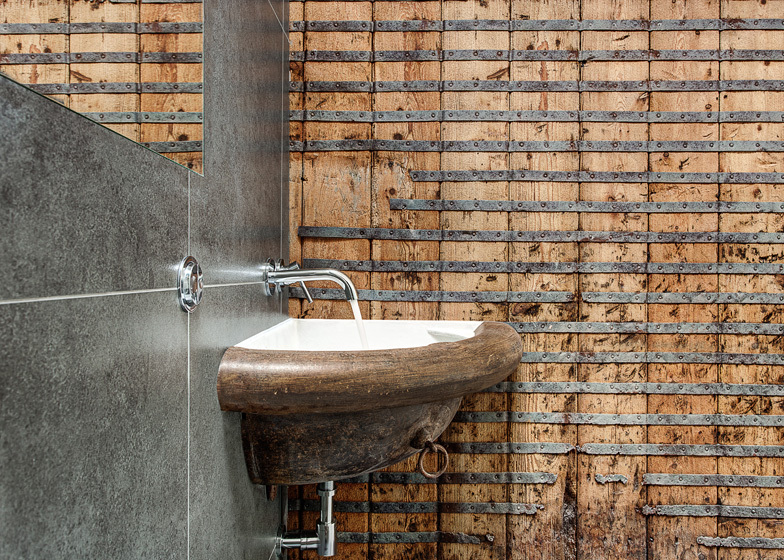 These include the old horse troughs, now used as sink basins, and tethering rings that function as towel hoops. 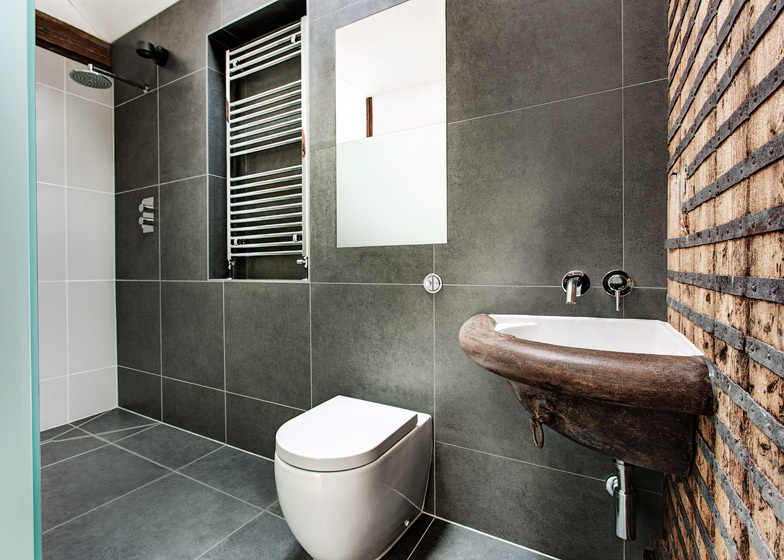 A polished concrete floor runs through the house, plus dark tiles line the walls and floors of each of the bathrooms. Earlier this year a Portuguese studio also converted a stable block into a family house, while a team of Copenhagen architects previously inserted an artist's studio with an anodised aluminium roof into an old stable in Denmark. Friday April 5th 1946, on a beautifully clear spring afternoon crowds cheered as the 25/1 racehorse, "Lovely Cottage", strode triumphantly past the finishing post to be crowned winner of the Grand National, the UKs largest horse race. Trained by Tommy Rayson and ridden by Captain Robert Petre at the first true Aintree Grand National race since 1940, after the Second World War, and the last to take place on a Friday, which had been the tradition since 1876. That weekend "Lovely Cottage" returned home to the small village of Headbourne Worthy, near Winchester. He received a hero's welcome before settling in for a well-earned rest in the stables at the Manor House where he was housed. These stables, that were once beautiful and functioning have since remained unused and have fallen into a state of dilapidation. Fortunately, this Grade 2 listed stable block, steeped in poignant historical character and narrative was not forgotten. It has been transformed into an elegant and contemporary 3 bedroom family home by RIBA award winning architects AR Design Studio. Practice Director, Andy Ramus, discovered this piece of overlooked historical heritage while undertaking a large scale refurbishment at the Manor House and immediately recognised its potential. The team at AR could see past its existing rundown state. There was a clear potential to create a sophisticated, contemporary family home within the historical context of the building and the picturesque Hampshire countryside. The history and character of the Stable's was very much a driving force in design and there is a firm belief at AR Design Studio that design constraints and restrictions can often create the most interesting solutions. The concept was to preserve the existing while making any new additions simple and pure in order to let the original character shine. 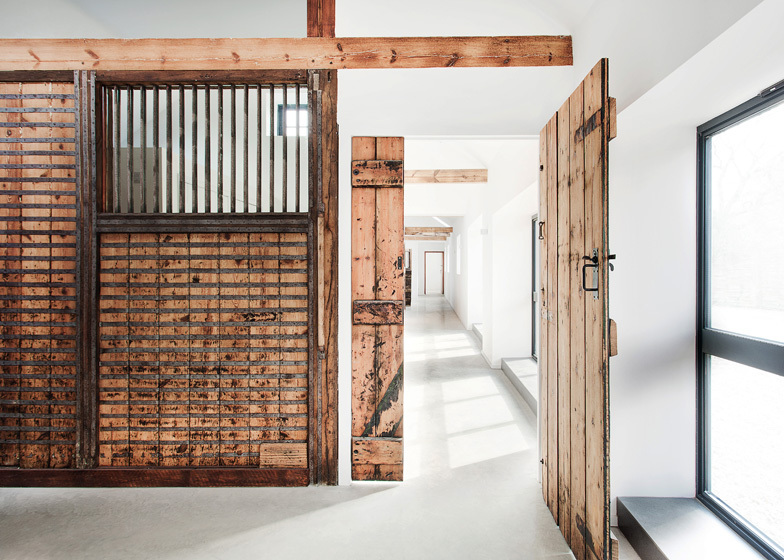 This results in an innovative arrangement of spaces according to the Stable's existing layout, in order to maintain many of the existing exposed timber interior walls. These were then cleaned, stripped back and refurbished to reveal an exquisite amount of detailing and craftsmanship. ￼￼￼￼The history and character of the Stable's was very much a driving force in design and there is a firm belief at AR Design Studio that design constraints and restrictions can often create the most interesting solutions. The concept was to preserve the existing while making any new additions simple and pure in order to let the original character shine. 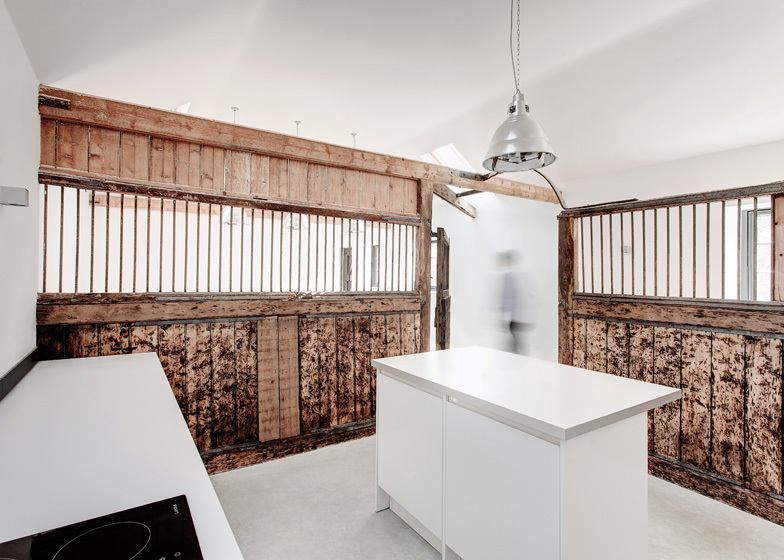 This results in an innovative arrangement of spaces according to the Stable's existing layout, in order to maintain many of the existing exposed timber interior walls. These were then cleaned, stripped back and refurbished to reveal an exquisite amount of detailing and craftsmanship. 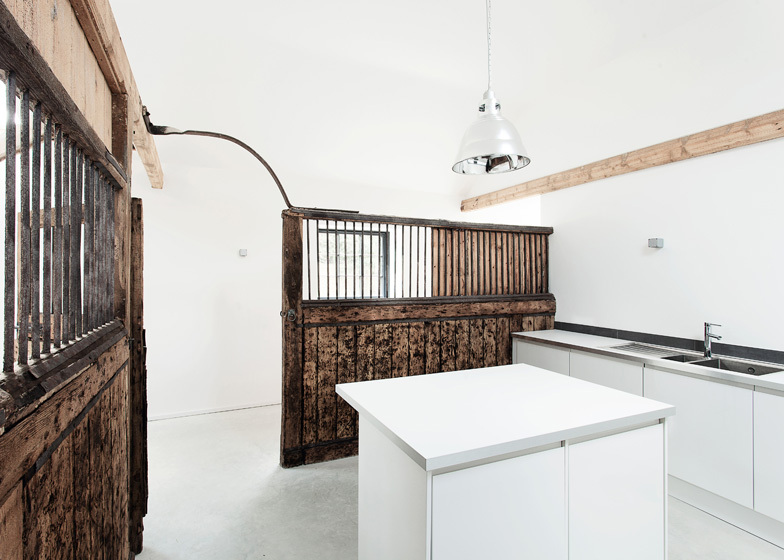 With the existing internal walls brought back to life, the next task was to turn the Stables into a home for the modern family and bring it into the present day. 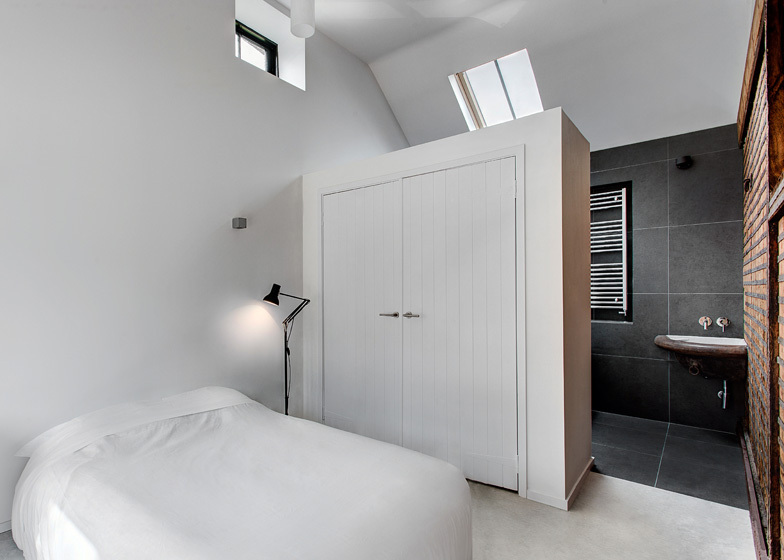 In order to respect the character of the property a clean, contemporary and neutral approach was taken to the rest of the renovation which juxtaposes perfectly with the original timber walls, allowing them to stand out as pieces of art against a beautifully simple contemporary backdrop. Many of the existing features were refurbished and re-purposed for use in the home environment; the original horse troughs were cleaned and converted for use as sink basins, the old horse ties act as towel rings in the bathrooms and original doors are preserved where possible to give a sense of real period character. 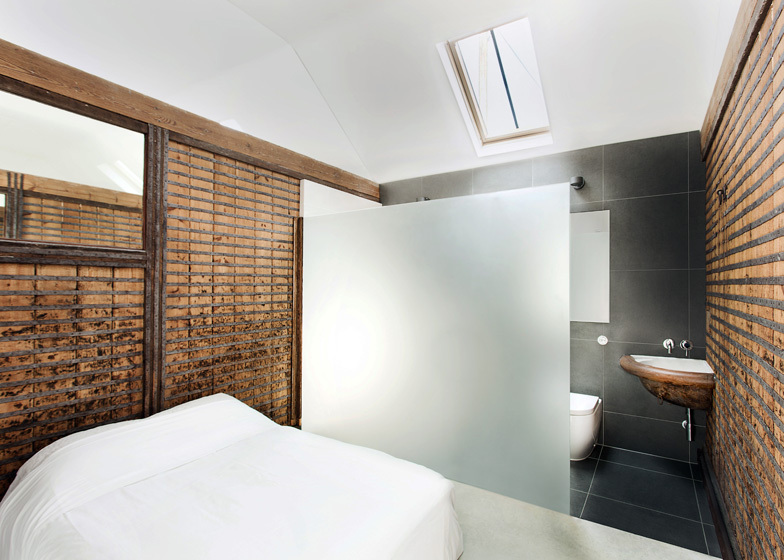 The Stables benefits from 3 large double bedrooms, with 2 en suite rooms to accompany a spacious family bathroom. Being a single-storey property with long continuous views, the layout was tailored and split between sleeping and living accommodation with a single constant circulation running through the entire building. The welcoming and spacious open-plan kitchen dining area is conveniently located at the heart of the home, leading into the light and roomy lounge which benefits from full height glazed doors that open out onto the sleepy village setting. 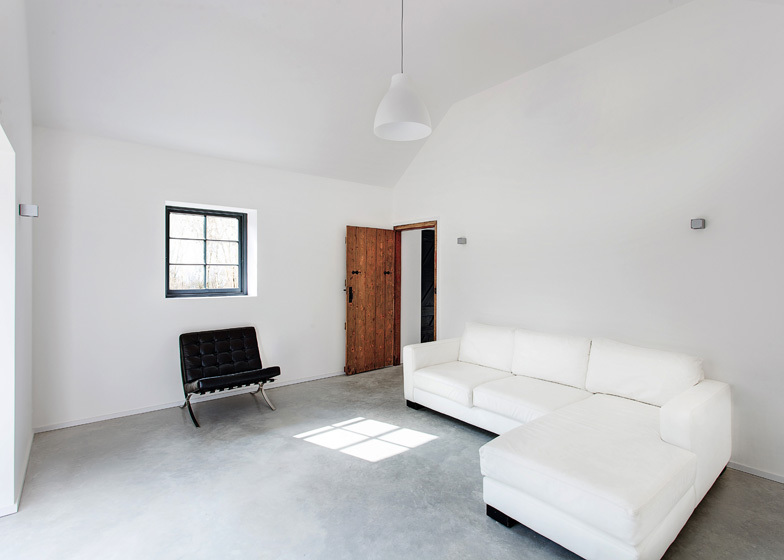 The entire property is super insulated, and the heated polished concrete floor throughout provides a functional uniformity to the spaces as well as recounting the Stable's agricultural history. New windows and roof lights fitted throughout give the whole place a warm, bright and clean feel; creating an excellent environment as a backdrop for a family home. 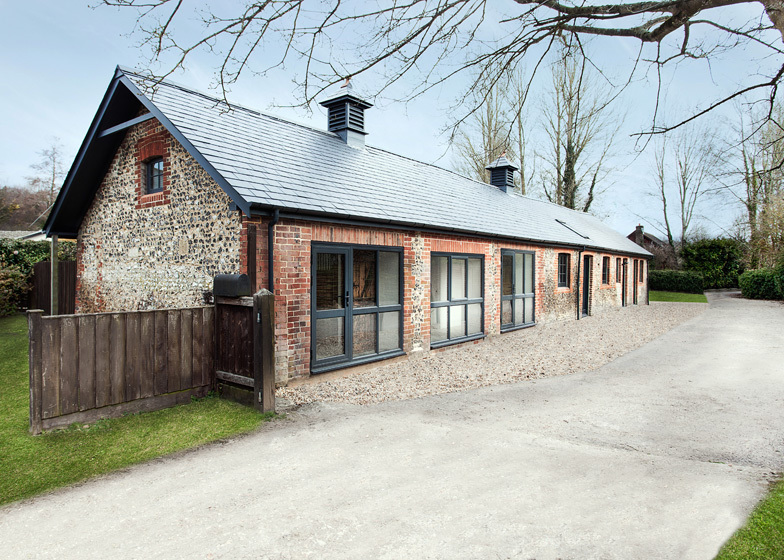 The finished Stables is completely transformed from its existing dilapidated condition and is now a perfectly working family home, bursting with contemporary style juxtaposed against delightful period character.